Do I need to join a collection society? Royalty collection societies use various reference numbers to track composers, compositions, performances and masters. These systems are not yet fully computerised and errors still occur. It is important to use the right numbers and allocate them correctly so the owners get paid. Barcodes are used for retail CDs and downloads online. Additional information is needed for registering releases, for example: publisher, label and co-writer names, dates and VT/Radio numbers for advert music. you’re not using distributors or big retail outlets. In the UK we don’t even need to register the copyright material. However, if you’ve used any session musicians, external copyright samples or songs, or want to sell through HMV (or any big retailer) you’ll need to jump through some hoops. The Official Charts site describes how to make records and downloads eligible for the charts. the pressing plant, number of copies and price information. You’ll need an ISRC (International Standard Recording Code) for each track to collect royalties on mainstream broadcast performances. ISRCs are administered by IFPI (the International Federation of the Phonographic Industry). These electronic identity tags for master recordings will eventually replace manual tracking of broadcasts for recording royalties. ISRCs are currently used by some radio, TV and internet broadcasters. Users register with IFPI (in the UK their agent for records is PPL and for videos is VPL) but there’s no charge for registration or allocating ISRCs. If you use a distributor or retailer you’ll probably need to bar-code your CDs and bulk boxes. It makes sense to bar-code these days, just in case. Digital distributors and aggregators use bar-codes to identify albums and single tracks. You can get bar-codes through some distributors and retailers (like CD Baby) and unless you’re planning a major operation that’s probably the best option. You may find UPC codes can be used in Europe whereas EAN codes can’t normally be used in the USA. Otherwise (if you can afford it) get your own series of bar-codes from GS1 UK (formerly e-centre). There’s a fairly hefty charge depending on your company turnover although AIM members get a discount. As with ISRCs, part of the EAN code is allocated to your company and a range is left to you for individual products (in this case CD titles). If you join PRS you’ll get a CAE code and your compositions can get ISWCs. If you join PPL you can get a PID and ISRCs for your recordings. You probably won’t need any other identification codes on the CD but it’s worth checking whether any of the others apply to you, your specific product or market. Individual collection society web sites give details of membership fees and how to join. Some societies insist you qualify by having commercial material available, but don’t be put off if you genuinely have material in the pipeline. It’s their job to represent rights-owners in the real world and their rules don’t override that responsibility. They can recover publishing royalties for a short period before you join as long as your work was properly identified and notified at the time. The general rule is that a label should join PPL and notify full details before releasing material. Performers’ PPL can then be held for any performers who can’t be traced (see Black box royalties) until they get a Performer’s ID. Publishing royalties may also be distributed retrospectively depending on the circumstances and the delay in claiming, as long as usage details are correctly reported by the recording user. You will find that monitoring and collection society data is prone to error. Tracks frequently get mis-recorded and mis-reported. Unfortunately collection societies are not good at correcting mistakes. Also bear in mind that all foreign usage (broadcasts, performances sales, etc.) should be notified to your royalty collectors. There are systems for aggregating foreign royalties but they are slow and not automatic. Collection societies have to be told the names and details of members’ recordings and compositions. This information is then combined with usage returns (cue sheets, set lists, etc.) from music licensees to calculate the royalties due. Details of compositions and recordings can be sent on the PRS/MCPS web site or using the JNWF form (for published, unpublished or foreign published works). The BPI CatCo and AIM aimlabeldata systems can be used to notify PPL, OCC and MCPS. 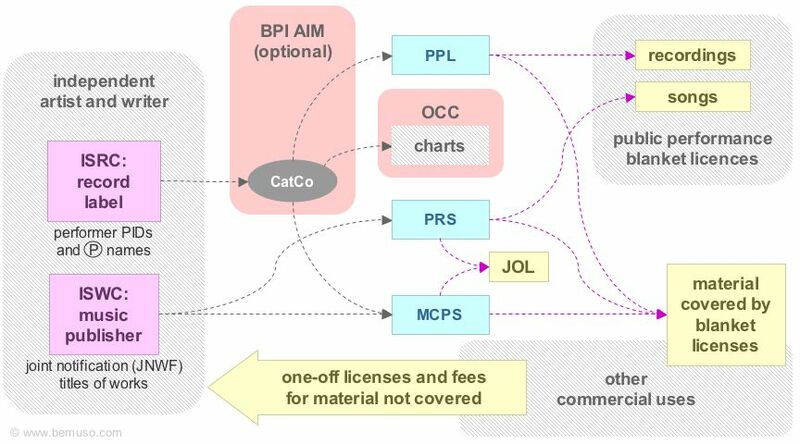 Catco (now called the PPL Repertoire Database) is a system operated by PPL for Major label and independent recordings so that PPL, OCC and MCPS can be notified of new material. AIM launched their own interface to Catco called aimlabeldata in 2002 but there seems to be no mention of it on their web site today. PPL members can use Catco so the AIM interface may now be redundant. These are the main notifications, permissions and licenses. Commercial users (and certain others) must get permission from the relevant societies, the label and the publisher unless the material is available under a blanket license. may join PPL to collect recording owner and performer royalties from venues and media. If you’re acting as a record label you should join PPL before you release any recordings. PPL must be notified of any recordings where others claim performance royalties (track IDs and Performer Identification Numbers). If your CD uses any external writer, publisher, record label and performer rights, you’ll need to notify collection societies and pay royalties as agreed under your clearances for the different works, recordings and performances. You may also need to keep some paperwork as proof (e.g. for PPL). Membership isn’t always necessary and can be a problem in some situations. some territories don’t have any effective copyright enforcement. Indie artists are likely to want their material circulated and performed more freely in clubs and online, and may depend on users who can’t afford heavyweight licenses. In some cases, especially online, they rely on non-commercial distribution where licenses will never be viable. These artists might put off joining a collection society until the benefits outweigh the disadvantages. There are three main things to consider when deciding which, if any, collection societies to join. Do you expect to earn royalties? Do you need them collected? Is it worth collecting them? 1. Have you earned any royalties? Are you due any royalties for duplicating your songs, performing your records, or recordings of your performances? For most people this would be from making or broadcasting records, or for playing on them. If not, you don’t need to join. Bear in mind MCPS and PRS collect royalties for sales made through licensed online music retailers such as iTunes. 2. Does anyone owe you royalties? Do royalties need to be collected from a third party? If you’re the only one making your records and performing your songs (including pubs, clubs and broadcasts etc.) you don’t need to join. PPL, PRS (and some record labels and music publishers) keep a “black box” of royalties for artists and composers that can’t be found. You would be due substantial PRS royalties for your own performances at very large venues or national broadcasts, but it’s likely you would have joined by the time that happens—see also PRS Gigs and Clubs Scheme. 3. Have you earned enough to cover your costs? Will royalties from your songs or performances cover membership costs? 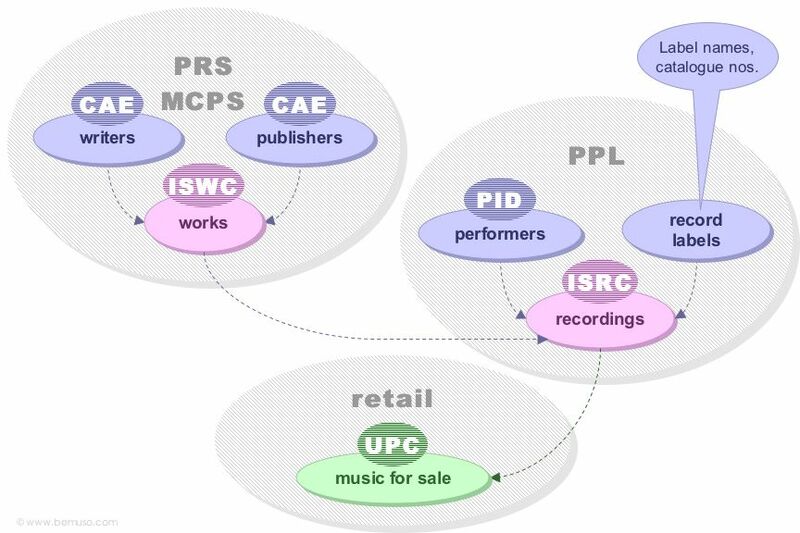 Collection societies take their commission from royalties, but PRS and MCPS charge a fee too. If you don’t expect to exceed this amount you don’t need to join. The same applies to any other musical compositions, and any other public performances, not just the examples here. Publishing and performance royalties may also be due from sheet music, video and film soundtracks, and other uses.